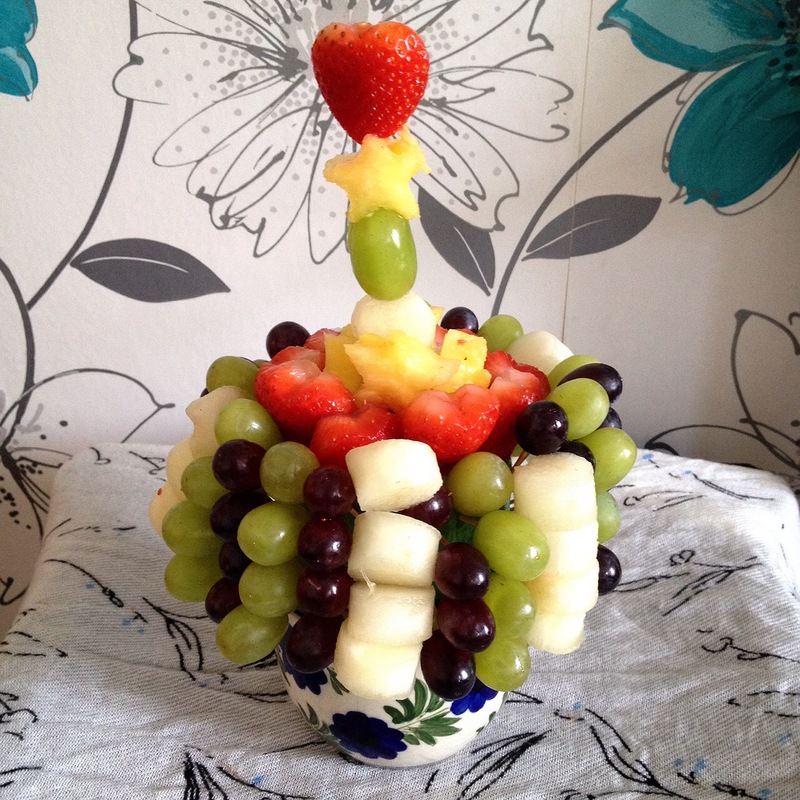 Ok so I promised to share a photo of a fruity creation I was asked to make. Since I occasionally make a sweet tree and its going to happen more often as I think its a lot nicer to receive that then a tray full of Mithai at weddings I have balls in various sizes. The idea I had was to buy an ice-cream sundae container and stick two different sized balls on top and insert the fruit in. However I couldn't find the container anywhere so I ended up with a plant pot and a cylinder shaped foam to insert the fruit into and I think it looks awful but as its my first attempt I'll learn from it. The tall stick looks weirder in the photos then for real as I just couldn't angle my phone right to get the whole thing in properly. It would have looked great having lots of tall skewers but it would be quite difficult for the groom to eat that as each guest wants to offer him a little something to eat so its easier having a small tooth pick instead. I used plenty of grapes as it just makes the whole thing that more affordable, melon, strawberries and pineapple. I had a tray underneath it with different shaped fruit in it too. Hopefully I won't be making one of these again in a hurry but lets wait and see because if I'm asked, I'm terrible at saying no. To cut my shapes I used Pop Chef. Its something my niece wanted at the beginning of the year but no one got her it. I ended up buying it for this but if I'd had time to wait I would have ordered it on eBay as its so much cheaper, all listings were for China though. This will work really well on fruit that isn't ripe in the least bit as fruit that is ripe will turn to mush. It worked really well on all the fruit I used, if the fruit does get stuck in the shaped tube, you receive a little plastic probing stick with it that easily pushes it in. Do any of you own it and what do you think of it? That looks so cool! Very nice and it makes such a great gift! I don't really plan things out but I like to have time to do it which is why this didn't suit me. You need to do everything on the day and if it goes wrong you can't do all that much about it. I'd probably get a few angry customers as its hard to pre plan this and if it goes wrong you've just got to accept it.